"Interstate 180 (California)" redirects here. For the state highway in California, see California State Route 180. I-580 is broken into pieces, and the length does not reflect the I-80 overlap that would be required to make the route continuous. Interstate 580 (I-580) is an 80-mile (129 km) east–west Interstate Highway in Northern California. The heavily traveled spur route of Interstate 80 runs from San Rafael in the San Francisco Bay Area to Interstate 5 near Tracy in the Central Valley. 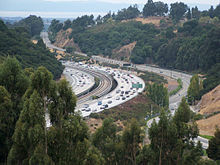 It provides a connection from the Bay Area to the southern San Joaquin Valley and Southern California via Interstate 5, as Interstate 5 bypasses the Bay Area to the east. A portion of I-580 is called the MacArthur Freeway, after General Douglas MacArthur. Other portions are named the John T. Knox Freeway (after a former California State Assemblyman and Speaker Pro Tempore who currently practices law at Nossaman LLP), the Eastshore Freeway (after its location on San Francisco Bay), the Arthur H. Breed Jr. Freeway (after a former California State Assemblyman and Senator—the stretch itself lying between the cities of Castro Valley and Dublin), the William Elton "Brownie" Brown Freeway (after a Tracy resident instrumental in determining the route of Interstate 5 through the San Joaquin Valley), the Sgt. Daniel Sakai Memorial Highway (after the Castro Valley resident and Oakland SWAT officer killed in the 2009 shootings of Oakland police officers), and the John P. Miller Memorial Highway (after the Lodi resident and California Highway Patrol officer killed while chasing down a DUI driver). Eastbound I-580 at Grant Line Road about one mile away from the I-580/I-205 split. Westbound I-580 at Altamont Pass between Livermore and Tracy. The western terminus of I-580 is roughly 10 miles north of San Francisco in the city of San Rafael (Marin County), at the junction with U.S. Route 101 (US 101). The interchange with US 101 is incomplete, only allowing continuous travel from southbound US 101 to eastbound I-580 (via exit 451B) and from westbound I-580 to northbound US 101. Heading eastward through the light industrial portion of eastern San Rafael, I-580 provides access to San Quentin State Prison at the eastern tip of land before joining the Richmond–San Rafael Bridge to cross San Francisco Bay. I-580 enters the city of Richmond in Contra Costa County mid-span, then continues through Richmond to join Interstate 80 in Albany at the "Hoffman Split." After joining I-80, I-580 runs directly south for several miles along the eastern shore of San Francisco Bay in the segment known as the Eastshore Freeway, then enters the MacArthur Maze. The segment between the Hoffman Split and the MacArthur Maze is a wrong-way concurrency, meaning I-580 east is signed as I-80 west, and vice versa. From the MacArthur Maze, I-580 is known as the MacArthur Freeway, which runs through Oakland and San Leandro to Castro Valley. About halfway to Castro Valley from the Maze, is an interchange with the Warren Freeway (State Route 13). Between this interchange and Castro Valley, I-580 runs near or along the trace of the Hayward Fault, a major branch of the San Andreas Fault. In Castro Valley, I-580 turns eastward toward Dublin Canyon before descending into Dublin and Pleasanton. After passing through Livermore, the freeway enters the Altamont Pass. The road emerges in the Central Valley west of Tracy, where, after I-205 splits near the Altamont Speedway, it turns southeastward and terminates by merging with I-5 south of Tracy just shy of the Stanislaus County line. I-580 provides Interstate Highway access between San Francisco and Los Angeles since I-5 runs east of the Bay Area. However, the primary control city listed on freeway signs along eastbound I-580 between I-80 and I-205 is instead Stockton, a vestige of when this segment used to be part of US 50. I-580 is part of the California Freeway and Expressway System, and is part of the National Highway System, a network of highways that are considered essential to the country's economy, defense, and mobility by the Federal Highway Administration. The route is eligible for the State Scenic Highway System, and is officially designated as a scenic highway by the California Department of Transportation from the San Leandro city limits to SR 24 and from I-5 to I-205, meaning that these are substantial sections of highway passing through a "memorable landscape" with no "visual intrusions", where the potential designation has gained popular favor with the community. Trucks over 4.5 tons are prohibited through Oakland between Grand Avenue and the San Leandro border. Specifically, eastbound trucks cannot travel beyond Grand Avenue/Lakeshore Avenue (exit 21B), and those going westbound must get off at MacArthur Boulevard/Foothill Boulevard (exit 30). They are instead instructed to take I-238 in Castro Valley and then I-880 through Oakland as an alternative route. The truck prohibition has been in effect since the freeway was built in 1963 as part of US 50. Both the Federal Highway Administration (FHWA) and the California Department of Transportation (Caltrans) imposed the restriction, partly because the City of Oakland already had a truck ban through the area prior to the freeway's construction. Since then, the restriction was grandfathered in when the freeway was both renumbered and added to the Interstate Highway System. As a result, it is the only segment of Interstate Highway in California that is not part of the National Truck Network (several other California state highways have similar truck bans such as SR 85, but not any other Interstates). With trucks normally rerouted onto I-880 instead of I-580 through Oakland, the former generally gets more traffic than the latter. For decades, the trucking industry lobbied to have the ban removed, but was unsuccessful due to local opposition. In 2000, the California State Legislature passed Assembly Bill 500, adding the I-580 truck restriction into the California Vehicle Code. The ban is temporarily lifted by the California Highway Patrol for short periods to reduce traffic congestion when major accidents occur on I-880 or I-238. High-occupancy toll (HOT) lanes along I-580 between Pleasanton and Livermore opened in February 2016. The eastbound express lanes stretch 12 miles (19 km) between Hacienda Drive and North Greenville Road. The westbound express lanes extend an additional two miles (3.2 km) west to San Ramon Road/Foothill Road. All drivers are required to use a FasTrak transponder weekdays between 5 a.m. and 8 p.m. with all other traffic allowed to use the lanes free of charge during other hours. The new switchable FasTrak transponder (first used in the Metro ExpressLanes in the Los Angeles area), with a special switch that indicates the number of occupants (1, 2, or 3 or more) in the vehicle, is needed in some cases. What is now I-580 from I-5 to Oakland was originally conceived as part of a loop Interstate with a directional suffix, I-5W. However, I-5W and most of the other Interstates around the country with directional suffixes were eventually renumbered or eliminated, except for I-35E and I-35W in Texas and Minnesota, and more recently Interstates 69W, 69C, and 69E in Texas. The former route of I-5W now corresponds to I-580 from I-5 to Oakland, I-80 from Oakland to Vacaville, and I-505 from Vacaville to I-5 near Dunnigan. For the most part, the I-580 freeway in this segment was constructed over or alongside the right-of-way of US 50, previously part of the old Lincoln Highway, during the course of the late 1960s and early 1970s. The segment which begins at the split with I-205 was constructed during the same period of time over a new right-of-way to a junction with I-5, running through some low hills on the west side of the San Joaquin Valley near the city of Patterson. In the 1990s, the freeway segment from Castro Valley through Pleasanton was enlarged and otherwise re-engineered in conjunction with the construction of the Dublin/Pleasanton Line of the Bay Area Rapid Transit. The BART tracks were placed in a new median between the westbound and eastbound lanes of I-580 as was the new Dublin/Pleasantion Station. The interchange with I-238 and the Hayward exit ramps was also re-engineered at this time. The I-580 freeway in this segment was constructed starting in February 1960, adjacent to the city streets which were part of US 50 between Castro Valley and the large interchange along the eastern approach to the San Francisco–Oakland Bay Bridge in Oakland now called the MacArthur Maze. The freeway was named in honor of World War II General Douglas MacArthur. Prior to the construction of this freeway, the various city streets of Oakland (principally 38th Street, Hopkins Street, Moss Avenue, Excelsior Avenue and part of Foothill Boulevard) had been named for the General as "MacArthur Boulevard" which, for the most part, still parallels the MacArthur Freeway. The naming occurred in 1942, by a resolution of the Oakland City Council. The freeway was opened to traffic in 8 segments until its completion in May, 1966 (last segment, connecting with State Route 238 (now I-238), in Castro Valley, opened May 20, 1966). The segment of I-580 running from the MacArthur Maze to San Rafael is the most recent to be signed as I-580, beginning in 1984. Before 1984, this segment was part of State Route 17 (SR 17). From the Maze to the interchange locally known as the "Hoffman Split" in Albany, just north of the Gilman Street interchange (Hoffman Blvd. was the predecessor of I-580 in this section---see below), I-580 follows the Eastshore Freeway, a wrong-way concurrency with I-80 for its entirety: northward on the Eastshore is signed I-80 east and I-580 west; headed southward, one finds signs indicating I-80 west and I-580 east. At the Hoffman Split, I-580 leaves the Eastshore Freeway in a northwesterly direction through the cities of Albany and Richmond. 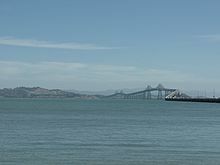 It then crosses San Francisco Bay over the Richmond–San Rafael Bridge. The freeway in this section, officially named the John T. Knox Freeway, was constructed from 1987 to 1991. It replaced a number of city streets which comprised the earlier highway leading to the San Rafael Bridge, principally, Hoffman and Cutting Boulevards. After crossing the bridge, I-580 runs west to San Rafael, ending at an interchange with US 101. This freeway segment supplanted an earlier boulevard constructed as part of SR 17. Interstate 180 was a temporary designation used in 1978 for the Richmond–San Rafael Bridge, now part of I-580. At the time the bridge had been identified as part of SR 17 but was marked for inclusion in the Interstate Highway System. Briefly the bridge used the number 180, despite the Fresno-area SR 180's use of the number. The California Streets and Highways Code has a policy against using one route number for multiple noncontiguous highways. Unless the existing SR 180 is renumbered, which is unlikely due to its familiarity as the road to Kings Canyon National Park, there will not be an I-180 in California. The segment of I-580 from I-680 to I-205 is undergoing significant expansion. Among the projects along this segment is the now-completed high-occupancy vehicle lanes in each direction, a westbound auxiliary lane between Fallon Road and Tassajara Road, the now-completed construction of a new interchange at Isabel Avenue in Livermore, the reconstruction of several interchanges, the construction of additional truck climbing lanes for the eastward ascent to the Altamont Pass, and plans to preserve the right-of-way to accommodate a future BART extension in the median of the freeway. Except where prefixed with a letter, postmiles were measured on the road as it was in 1964, based on a south-to-north alignment (as originally conceived as part of I-5W, as well as the segment that was formerly part of State Route 17), and do not necessarily reflect current mileage. R reflects a realignment in the route since then, M indicates a second realignment, L refers an overlap due to a correction or change, and T indicates postmiles classified as temporary (for a full list of prefixes, see the list of postmile definitions). Segments that remain unconstructed or have been relinquished to local control may be omitted. The numbers reset at county lines; the start and end postmiles in each county are given in the county column. ^ a b c d e f Indicates that the postmile represents the distance along I-80 rather than I-580. ^ a b c d Exit numbers follow I-80 rather than I-580. I-580 features prominently throughout the Sons of Anarchy series. The backstory of the series establishes that "First 9" (SAMCRO co-founder) John Teller died in a collision on November 13, 1993, 15 years before the pilot episode takes place, and SAMCRO establishes a roadside memorial to Teller near the crash site. In the final scenes of the series finale, Jax rides his father's restored classic motorcycle to visit that memorial, before taking a last ride on I-580. I-580 through the Altamont Pass is a stage in the 2011 racing video game Need for Speed: The Run. ^ a b c "Special Route Restriction History: Route 580". California Department of Transportation. Retrieved October 2, 2015. ^ "Special Route Restrictions". Caltrans. Retrieved October 2, 2015. ^ Corbett. "California Assembly Bill 500". Leginfo.ca.gov. Retrieved January 26, 2013. ^ "New I-580 Express Lanes Now Open In East Bay". KGO-TV. February 19, 2016. Retrieved February 23, 2016. ^ a b "I-580 Express Lanes". Alameda County Transportation Commission. Retrieved February 26, 2016. ^ Richards, Gary (February 18, 2015). "Roadshow: Who Needs the New FasTrak Device (and a Mylar Bag)". San Jose Mercury News. Retrieved February 28, 2016. ^ Peterson, L.M. (March–April 1960). "US 50 Freeway: State Begins Construction on MacArthur Freeway in Oakland". California Highways and Public Works. 39 (3–4): 8. ISSN 0008-1159 – via Archive.org. ^ Peterson, Gary (June 13, 2013). "Bay Area Roadways: Where'd the Names Come From?". San Jose Mercury News. Retrieved August 28, 2018. ^ "I-580 Corridor Improvements: Project List". Archived from the original on January 11, 2007. Retrieved March 2, 2009. ^ Fitzpatrick, Kevin (November 5, 2013). "Sons of Anarchy Review: 'John 8:32'". ScreenCrush. ^ Hinckley, David Hinckley (October 28, 2014). "Sons of Anarchy Season 7, Episode 8 recap: Jax and his SAMCRO crew are revved up for revenge in 'The Separation of Crows'". New York Daily News. ^ Keveney, Bill (December 10, 2014). "The 6 biggest moments from the Sons of Anarchy finale". USA Today. ^ Barney, Chuck (December 10, 2014). "Sons of Anarchy finale recap: The way it had to end". Contra Costa Times. 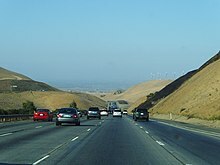 Wikimedia Commons has media related to Interstate 580 (California). This page was last edited on 6 April 2019, at 19:53 (UTC).